This is an old item now and the maximum operating System that can be loaded on it is OS X 10.7. It is a good little cheap starter Mac or great as a media centre. These do not come with Keyboard mouse or monitor you would need to purchase them separately. They do not need to be a Mac one just any USB keyboard and mouse and a DVI monitor. The Apple Mac mini “Core 2 Duo” 1.83 features a 1.83 GHz Intel “Core 2 Duo” (T5600) processor, a 2 MB on-chip level 2 cache, a 667 MHz frontside bus, 1 GB of 667 MHz DDR2 SDRAM (PC2-5300) memory, a 5400 RPM, 80 GB Serial ATA hard drive, a slot-loading 8X single-layer DVD/CD-RW “Combo” drive, an “Intel GMA950 graphics processor with 64 MB of DDR2 SDRAM shared with main memory”, and a bundled Apple Remote. Connectivity includes DVI (DVI-to-VGA adapter included) and Firewire “400”, four USB 2.0 ports, combined “optical digital audio input/audio line in” and combined “optical digital audio output/headphone” minijacks, a 10/100/1000Base-T Gigabit Ethernet port, and built-in AirPort Extreme (802.11g) and Bluetooth 2.0+EDR. 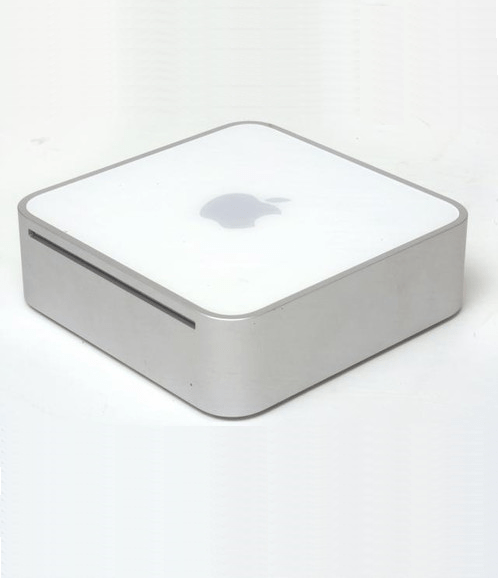 All Mac mini models have the internal components cleverly enclosed in a tiny and elegant 2.9 lb, 6.5 inch square, two inch tall case with a built-in speaker and an external power supply. Additionally, all Mac mini systems ship without a display, keyboard, or mouse, but numerous Apple and third-party options are available.